A research team at UBC’s Okanagan campus is investigating whether brief, high-intensity exercise workouts can prevent onset of diabetes in people who are at risk of developing the disease. 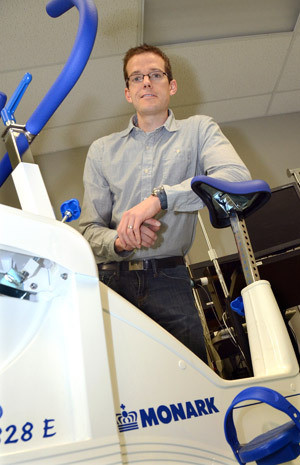 Post-doctoral fellow Jonathan Little, along with School of Health and Exercise Sciences faculty members Mary Jung, Phil Ainslie and Sally Willis-Stewart, are conducting follow-up research based on a McMaster University proof-of-principle study which appears in the latest edition of the Journal of Applied Physiology. Little, who worked on the McMaster study for his PhD dissertation, will lead a year-long follow-up study with approximately 20 subjects who are predisposed to the onset of type 2 diabetes due to dietary habits, glucose intolerance and body weight. The small McMaster study, conducted on patients with type 2 diabetes, found that three, 20-minute high-intensity intermittent exercise sessions per week, resulted in lower 24-hour blood sugar concentrations, reduced blood sugar spikes after meals, and increased skeletal muscle mitochondrial capacity, considered a marker of metabolic health. These benefits were realized after only two weeks of exercise training. The UBC study is being funded by an internal grant from the Faculty of Health and Social Development.